Leider ist diese Seite zur Zeit nur auf Englisch verfügbar. MATAA is an extremely flexible and versatile audio analysis system. 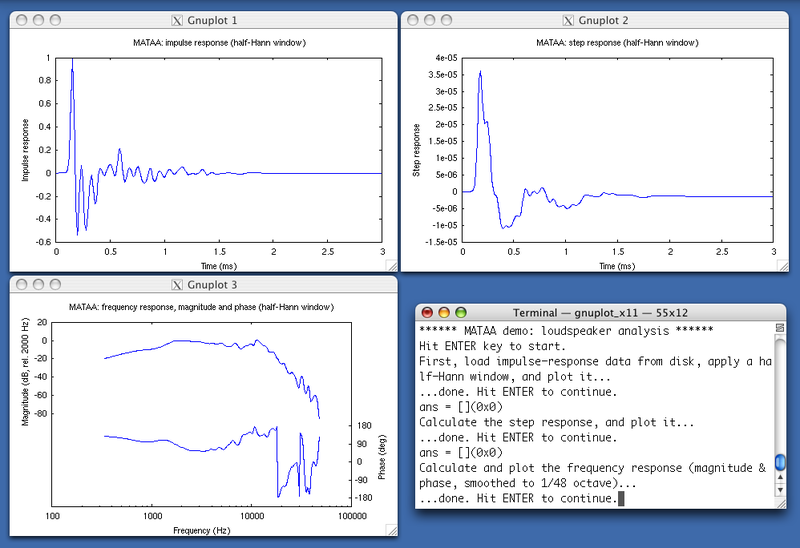 Similarly to many other computer-based audio analysis systems, MATAA applies a test signal to the device under test and simultaneously records the response signal for subsequent analysis. MATAA uses the computers built-in soundcard (or an external audio module) to play and record test signals to and from a device under test. MATAA runs on all sorts of computer platforms because it uses Matlab or GNU Octave as a base (these are powerful number crunching programs which provide a huge toolbox of routines for data analysis and processing). This explains why MATAA is so flexible and easily extendible with custom test signals, data analyses, plotting procedures, and scrips to automate routine measurements. MATAA is distributed as free software under the GNU General Public License. For further information read the MATAA article in the audioXpress journal (I also provide the original version of this article, where the command examples are easier to read). Make sure you’ve got Matlab or GNU Octave installed on your computer. I tested MATAA on Matlab version 6 and 7 as well as Octave 2.1, 2.9 and 3 (I highly recommend Octave 3.0 or newer). Matlab is a commercial and proprietary software, whereas Octave is free and open source. See below to find out how to obtian and install Octave for your computer platform. Download a recent version of MATAA as a zip archive from the MATAA project website at sourceforge.net. Unpack the archive (if your browser didn’t do so already). If you later need to update to a more current version, download the most current package file, expand it and replace your previous version with the new one. Follow the instructions in the manual included with the files you downloaded in the previous step to install MATAA in your Matlab/Octave environment. Other users subscribed to the mailing list can respond and participate in the discussion. Mailing list contributions will archived and will always be publicly accessible through archive. If for some reason you cannot use the mailing list, you can still try contacting me directly by email. The picture at the top of this page shows a screenshot of MATAA in action (with Octave 2.1 on Mac OS X). Complain if something does not work as expected! Chances are you found a bug, or the documentation is unclear. These things can only be fixed if you report them. Suggest new functions and tools for MATAA. MATAA supports sound input and output on Mac OS X and Windows (thanks to Shu Sang [sangshu@hotmail.com] for enabling sound I/O on Windows using ASIO! ), but not yet on other operating systems (e.g. Linux). Someone needs to enable sound input and output for MATAA on Linux (and other operating systems). The program(s) that handle the sound input and output from the soundcard are based on PortAudio, which provides a platform-independent environment for audio programming. Compiling the MATAA programs for sound in/out for different Linux distributions should be straightforward. I can’t do this, however, because I do not have a Linux computer. If you think you can help in any way, please get in touch through the MATAA mailing list (see above). The official Octave site has the source code and instructions on how to compile and install Octave. That’s not the most convenient method, though. There are binary versions of recent versions of Octave available for Mac OS X and Windows at sourceforge. Most Linux distributions have recent versions of Octave in their repositories. Use the package manager for your flavour of Linux to install it. Dieser Eintrag wurde veröffentlicht in Messtechnik von mbrennwa. Permanenter Link des Eintrags.